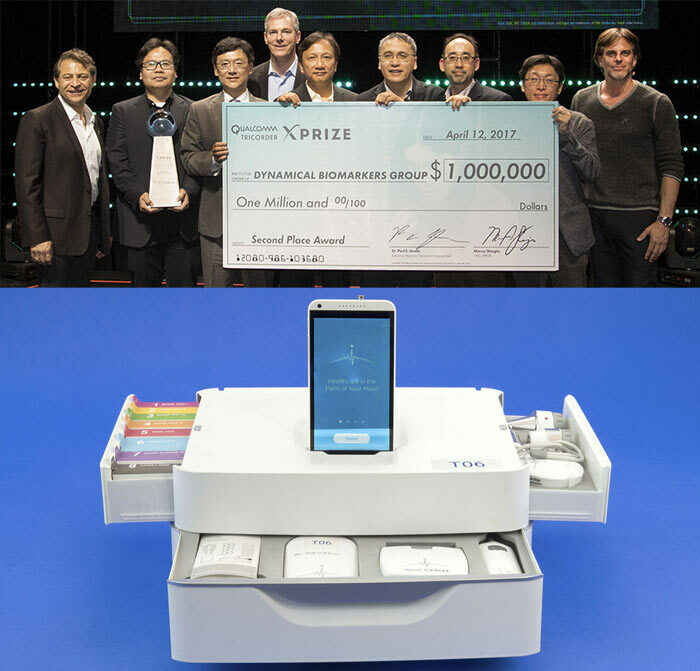 Last week Qualcomm's Tricorder XPrize quest, launched in 2012, came to an end. 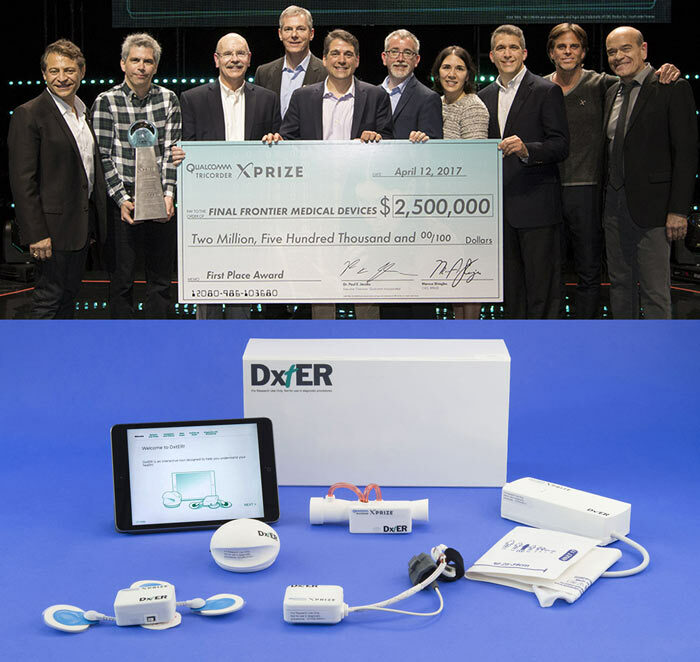 A team of scientists and engineers from Pennsylvania-based Final Frontier Medical Devices won the biggest chunk of the $10 million prize fund ($2.5 million) with their DxtER machine. Runners up collecting $1 million were Taiwan's Dynamical Biomarkers Group, backed by HTC. Both these teams won an additional $1 million last year, just for being finalists. The purpose of the Qualcomm Tricorder XPrize was to inspire inventors to create a medical device similar in function to the Star Trek Tricorder. Some say Star Trek tech has already inspired flip phones and iPads, but the Tricorder was potentially the most useful practical portable tool wielded by the space adventurers upon the USS Enterprise. "The winning team will develop a Tricorder device that will accurately diagnose 13 health conditions (12 diseases and the absence of conditions) and capture five real-time health vital signs, independent of a health care worker or facility, and in a way that provides a compelling consumer experience." In a blog post about the winners, Qualcomm says that the winning devices exceeded the competition requirements for user experience. However, both top placed devices failed to meet the "challenging audacious benchmarks for diagnosing the 13 disease states". So these devices are evidence of significant steps in portable healthcare, but as admitted prototypes they are still moonshoot projects that require further time for refinement. Sci-Fi fans might also be slightly disappointed that real-life Tricorders aren't as 'magical' as the Star Trek devices. Some competition devices required a blood or urine sample, for example. Nevertheless such devices have the potential for allowing medical diagnosis where otherwise health issues might get untreated due to lack of trained doctors, for example. most people taht use phones couldnt even pick the right colour….. <Oi - watch your language. That is not acceptable - Admin> zombies the lot of them, reminds me of when I first made a pc and then had how to work out how to use it ( this was in dos days). Given the gui devolopment, cpu and gpu advances since then… I can only conclude people are reatarded in some way when they walk and spend half there day look at a phone bent at the shoulder and not having a clue whats happening around them ? most people taht use phones couldnt even pick the right colour….. zombies the lot of them, reminds me of when I first made a pc and then had how to work out how to use it ( this was in dos days). but don't worry, this is a perfectly natural phenomenon. Every recorded generation has perceived itself as better than the those either side of it (younger and older) whilst recanting stories of the hardships of “their day” compared to the youth of today who “don't know they're born” - fear not, there are documents of ancient Greeks saying the exact same thing, you're not unique in that regard. The irony, of course, in the perception of a “generation of zombies”/stupid people is that we are currently living in the most advanced state humans have ever existed in, and tomorrow that will be advanced even further and will continue to do so. What a load of Rhubarb.